On the evening of 17 December 2010, hackers defaced the Econet Broadband website (www.econetbroadband.co.zw) with some nasty message about Econet not caring about its customers. 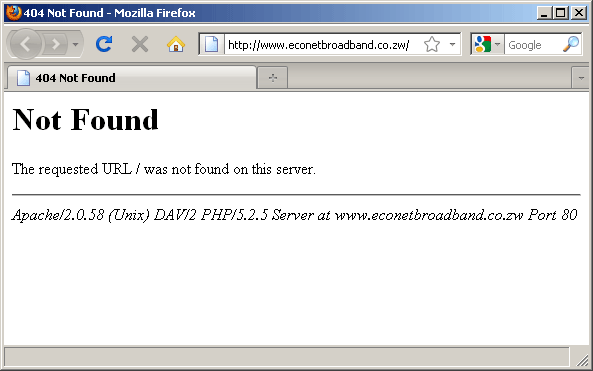 Econet took the website down some several hours later, along with the main Econet website www.econet.co.zw. The main website was brought back online a week or so after the incident, but the attacked website is still offline and it remains so to this day, more than a month later. This, despite Econet Broadband adverts in the press referring to it for more details. Anyway, we hear (from some friends at Econet) that the website’s security holes are getting plugged by some South African ethical hackers. Hopefully this won’t take too long. As for the Zimbabwean hacker causing Econet all this needless pain, there’s no saying if he (or she) will be caught. Actually, there’s no saying if current Zim laws even define what he did as crime. Just early this month, the Computer Society of Zimbabwe president, Mr. Atwell Mukusha was on TV bemoaning the lack of legislation in Zimbabwe to deal with cyber crime. 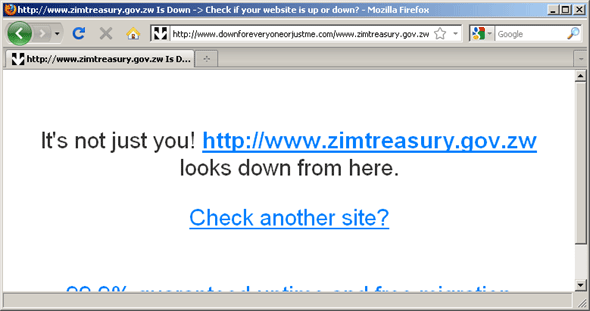 Econet is not alone in this; a Zim government website (www.zimtreasury.gov.zw) was also defaced last month, reportedly by hackers working in solidarity with Wikileaks. The website is also still down.